Painting and printmaking are mediums, which allow me to turn my unconscious world into something physical, and turn the physical world into something dreamlike. 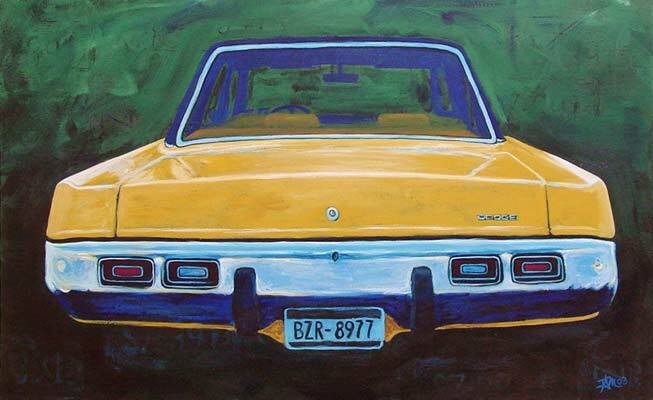 My paintings begin with the attraction for the sculptural aspect of classic car design. The focus on the rear is a non-traditional view of the classic car that often creates the illusion of driving away and evoking a mystery and a question; where are we headed, or, where are you taking me? The symbols that are stamped continue the dialogue. Their origins vary from a hula girl that sits in the rear window of a 1960 Studebaker (Duce), to circling ravens that add a sense of doom that accompanies the 1962 Cadillac Ambulance (Blood Drive). The heavy chrome, which is highly reflective, adds an abstract view of the outside world. The chatter of color and contrast of light give the cars an extraterrestrial feel, they float in time and space and are not restricted by gravity. They levitate and drive away.